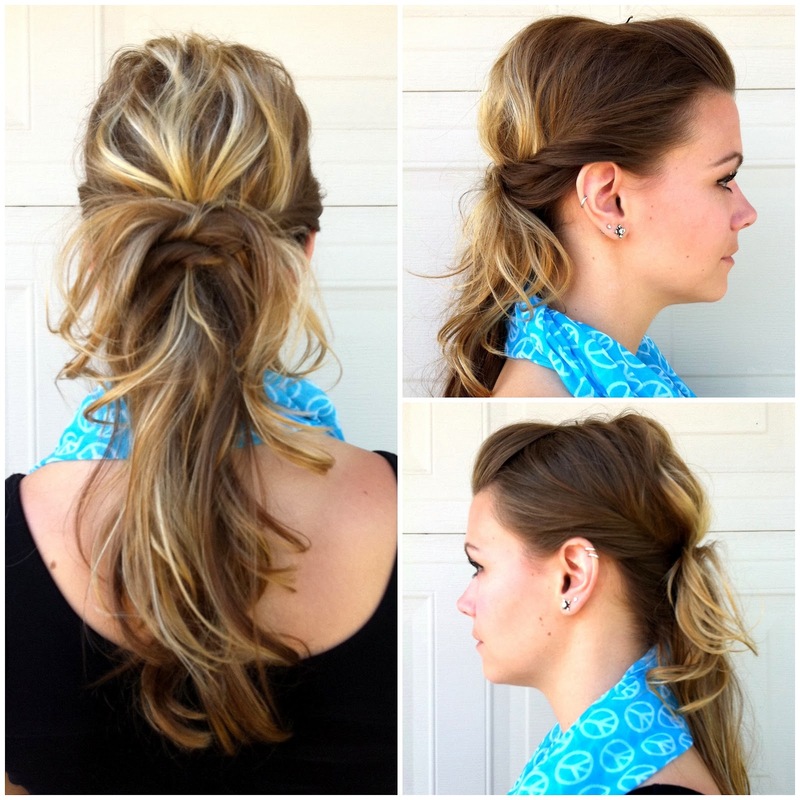 Today, I get to share with you a lovely hair tutorial for a twisted pony. It's really similar to this twisted side pony that I did. I was going on second-day hair that day, so I bobby pinned my front pieces up into a bump. Just like in the twisted side pony, I gathered a small section of hair at the nape of my neck and secured it in a low ponytail with a clear elastic band. Working from the bottom to the top with the loose hair, I gathered small sections and began twisting them backwards and pinning them around the clear elastic band. I would twist and pin a small section from the right, and then switch it and twist and pin a section from the left. You don't have to twist the pieces back, but as you can see in the top right photo, it gives the hair some cool definition. Try to hide the bobby pins. If you can't, it's OK! Once it was all pinned, I separated and tugged on a couple pieces to give my hair a bit more volume and texture. Finish with a light veil of hairspray! I'd love to see you try this look! If you do, make sure to tweet or instagram me a photo with the hashtag #twistedpony! Want to know more about beauty week and all the fun that took place? And now, per my usual Friday link-up, don't miss out on the fun! PS> the first 5 links were the ladies who participated in Beauty Week. Make sure to say hello! I love it! I'm definitely going to give it a try! Your hair is SO PRETTY! Love this! I really need to finish growing my hair out so I can pull of styles like this haha :) Thanks for sharing! New follower!